For our first prototype, we used a digital camera for the detection of fluorescence. However, it was difficult to make measures with the same conditions as digital cameras have automatic settings. Robin told us about CHDK (Canon Hack Development Kit), which is a firmware enhancement that works on a lot of Canon PowerShot cameras. This free software can be loaded manually on the memory card of the camera and can be easily removed if needed, moreover it does not affect the original software of the camera. 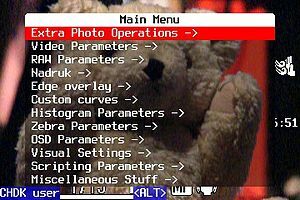 CHDK also allows to write scripts in order to automate the camera, the scripting languages are Lua (filetype: *.lua) and uBASIC (filetype: *.bas). Another supplementary feature is the addition of an USB remote, which works by using simple push button switch, a USB cable and a battery. This remote device allows to control the operation of the CHDK-enabled camera and could be interesting to add to our device. Different versions of CHDK exist, such as StereoDataMaker, that permits to take stereo photographs. As the camera’s microprocessor is very flexible, developers keep working to add more features to this software. To have all these functionality, it would have been necessary to buy an expensive camera, so using this software together with a cheaper camera is a good alternative, as well as DIY and open source, which correlates well with the spirit of our project! tthe courage to go ahead and give you a shout out from Porter Tx! Just wanged to mention keep up the great work!